Omega Spirulina is a tasty mix that will accommodate pleasantly : raw vegetables, salads, grilled meat or fish, vegetables, casseroles, soups. Can also be enjoyed as an aperitif. 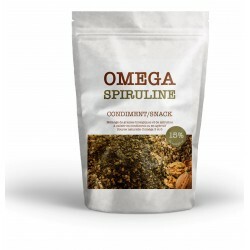 Delicious blend of organic seeds and spirulina to accommodate all your culinary preparing pleasantly. This mixture will be too perfect to enjoy an aperitif with friends. Omega 3 fatty acids are "essential" because the body is unable to synthesize. Therefore one power can bring. This mix consists of seeds rich in omega 3 and 6: flax seeds, hemp seeds, walnuts, pumpkin seeds. To get the benefits, the seeds were crushed because the body is not able to eliminate the hard, fibrous shell that wraps flaxseed and hemp. Spirulina is a very nutritious Micro blue algae, spirulina is a perfect ally to ensure a balanced diet and strengthen the immune system every day. Allergens : Nuts. May contain traces of sesame.